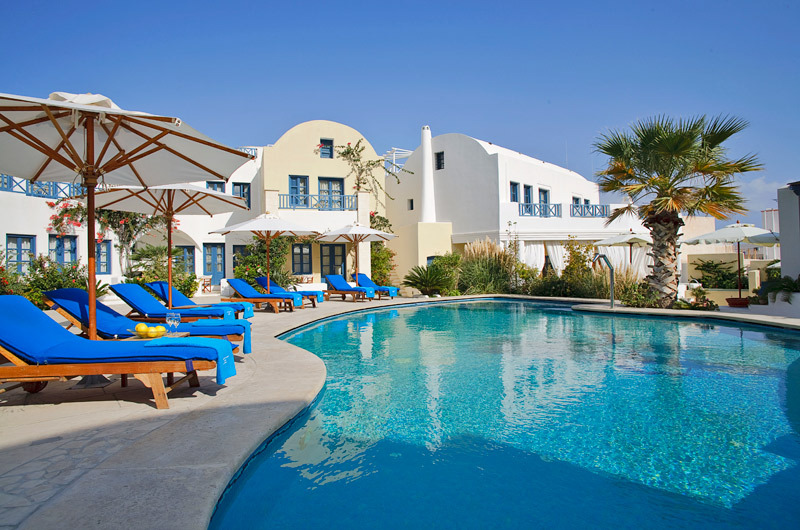 Tamarix del Mar is a 5 star traditional hotel on Santorini island, situated at the foothills of ancient Thira, just a short walk from the beautiful black sand beach of Kamari. Tamarix del Mar suites depict in miniature a traditional Santorinian settlement. Five traditional two-storey buildings are situated around the pool, built in accordance with the architecture of the island. Some white and others pale ochre, the Aegean-blue doors and windows keep the hotel’s warmth and hospitality inside its suites. In the middle of the hotel complex, the unusually-shaped pool with its hydro-massage offers a cool and peaceful relaxation out of the brilliant sun. Once having entered the hotel, you can feel the friendly atmosphere and the gracious welcome of the stuff! Tamarix offers superb Suites & Junior Suites. All the suites have an individual colour scheme, mood & style. The Junior Suites overlook the pool and several have a mountain view of Ancient Thira or Kamari Bay while Superior Suites offer mountain views of Ancient Thira and Kamari Bay. In any type of junior suite, maisonette or suite you have chosen, you will enjoy the marvellous and unique decorated and furnished suites. Tamarix del Mar accommodation facilities offers you the most comfort and relaxing private space for your vacations. The hotel facilities are giving also many alternatives for free time. The enhanced American breakfast, which you can enjoy also in your suite is an experience. At the surrounding of the swimming pool you can enjoy a splendid lunch from a variety of many special dishes, salads or special exotic dishes. Tamarix Junior Suites: All Junior Suite are 35 - 40 m2, and can accommodate up to 4 adults. They are unique furnished and decorated, offering a bedroom, a living-room area, a lunch or dinner table, fully equipped kitchenette, Jacuzzi, private services. One of the Junior suites is modified to accommodate persons with special needs or kinetic disabilities. Tamarix Superior Suites are 50 - 65 m2 and offer 2 separate living areas, a master bedroom and living room which can also be utilized as a second bedroom. They offer the same facilities as the Junior suites (except the kitchenette) and have a telephone in both areas. Room occupancy is between up persons. Tamarix Del Mar hotel offers fabulous standard Maisonettes and Luxury Maisonettes. Each Maisonette has its own individual colour scheme, furnishings & style. All have a mountain view and overlook the pool. Most offer a view of Ancient Thira, while several also have a sea view The Luxury Maisonettes offer all the standard facilities as well as a private rooftop Jacuzzi for 4 - 5 persons All maisonettes are 40-50m2 and are on split levels with a connecting interior staircase. They can accommodate between 1 to 5 adults. Standard Maisonettes: they offer the same facilities as the Junior Suties as well as a terrace or veranda on both levels. Luxury Maisonettes: further to the standard facilities, they offer a private rooftop Jacuzzi for 4-5 persons, with spectacular views of the volcano rock mountainside of Ancietn Thira , the swimming pool and Kamari Bay. Tamarix Del Marhas created a beautiful Health & Beauty Spa. In it one can find a fabulous interior Jacuzzi swimming pool decorated with rich wall murals of turtles and seashells in shades of deep royal blue. Intimate corners offer bamboo chaise longues & reclining beds, while the stone tiled pool offers reflections of subtle spot lighting on roof & poolside. Next to the heated indoor swimming pool are the sauna and the gym area, where guests can work out and wind down. The gym possesses all the aerobics machines necessary for a rigorous daily exercise, and in combination with a few laps in the swimming pool, guests should be ready for the sauna. Also private masseuse , hair stylist or manicurist-pedicurist service is offered with a request at the reception.